I am willing to admit I have never been a back sleeper until recently. I started experiencing neck and shoulder pain and ended up spending lots of time and money at a chiropractor. After lots of sleepless nights I turned to Google and came across Back to Beauty Sleep. The Back to Beauty Sleep is primarily marketed as a beauty sleep pillow that is an anti-wrinkle head cradle. Yes, that is all well and good but I was looking for more. I needed something to retrain my sleeping habits and help position my head and neck. I reached out to the company and was beyond thrilled that they wanted to work with me. The pillow is smaller than a standard willow, this makes it great for traveling. If you are used to a bigger pillow that's okay. There is not an issue if you would like to place this on the top of your normal pillow. But the first thing you really notice is the head positioning cradle. I was very impressed with how well the pillow was made. It is fluffy without being overly soft and mushy. My head did not sink into it and it did not become flat and uncomfortable. It comes with 2 pillowcases : a satin smooth and crisp cotton one also. After sleeping with the pillow just a few weeks I can say I feel so much better. The heaviness that I was feeling has decreased tremendously. I have more range of motion in my neck and shoulder. Overall I get more quality of sleep and wake up feeling refreshed. So is this a beauty pillow? Yes...but to me it is so much more. The patented Back to Beauty™ Anti-Wrinkle Head Cradle beauty pillow isn’t just another back sleeping or wrinkle-prevention pillow – it’s an incredibly versatile and soft, yet supportive, form-fitting head cradle that aids in training you to consistently and comfortably sleep on your back while eliminating pressure on, or anything touching, your facial skin during sleep. We understand and respect that everyone is different. That is why Back to Beauty’s patented design, with fluffy hypoallergenic down-alternative fiber, was created specifically to enable use in various positions to allow you to find your personal comfort zone. 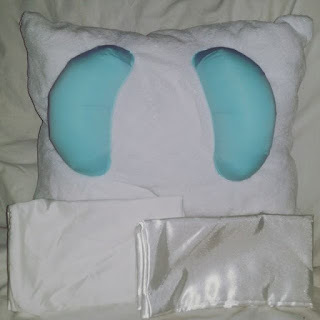 Back to Beauty is foam free, and won't compress to get hard and hot like foam mold pillows can, and retains a full and luxurious feel that supports the neck and stabilizes the head during sleep.